Stretchy watches are so easy to make, you may want one for every outfit in your closet. If you love to make handmade jewelry, consider learning how to bead a stretchy watch band. In no time at all, you'll be well on your way to creating a fashionable and one-of-a-kind timepiece. In fact, you may just decide to create a different watch for every outfit in your closet! The supplies to make stretchy watch bands are fairly inexpensive, making this a great project for the frugal crafter. Learning how to bead a stretchy watch band requires no knowledge of advanced jewelry making techniques. In fact, tweens and teens can easily make their own creative watches with minimal adult supervision. A beaded stretchy watch makes a great gift for someone who has mobility issues that may affect her ability to manipulate the clasp mechanism on a traditional watch band. Fire Mountain Gems has both gold and silver watch faces in contemporary as well as traditional design choices. The Virtual Touch is a fabulous resource for crafters in search of truly unique watch faces, including holiday designs. IBead is a good choice for crafters who plan to make watches to sell or give as gifts, since they offer a bulk discount for purchasing five or more of the same design. After gathering all of the necessary materials, you can bead a stretchy watch band in under an hour. Use your bead board to design a pattern for your watch. Generally, mixing two or three different kinds of beads will result in the most pleasing look. Try smaller metal beads for a neutral look or work with an assortment of bright colored beads if you want a funky watch that's guaranteed to attract attention. Cut a piece of stretch beading cord approximately 10 inches long. Tie one end of the cord onto your watch face. Secure the knot with a small dab of clear nail polish. Thread the beads onto the cord. Finish your watch by making a knot on the other end of your watch face. Typically, a beaded watch is between seven and eight inches long. Secure the knot with a dab of clear nail polish. Use your scissors to trim any loose threads. Although learning how to bead a stretchy watch band is a fairly simple process, you may wish to branch out to create other types of watches as well. 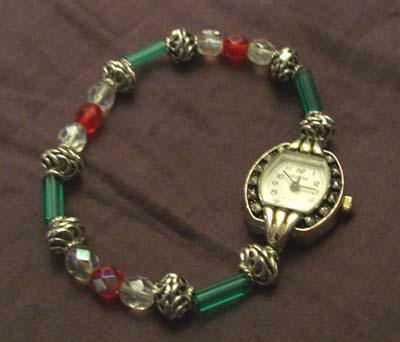 For example, a wire and bead watch is a beautiful and elegant fashion accessory. Many of the reference books devoted to helping beginning beaders learn more about the craft also contain instructions for designing your own watch.